The three-year post-graduate programme in Interlinguistic Studies was founded in 1997 within the Institute of Linguistics (Department of Modern Philology) in the University Adam Mickiewicz (UAM) Poznań, Poland. The first programme began in 1998, and a new programme cycle has regularly followed every three years since then. In 2017, the programme celebrated its 20th anniversary, and at the same time launched its 7th study programme with 20 participating students from 12 countries (China, Korea, Turkey, Brazil, US, France, Switzerland, Germany, Spain, Russia, Kazakhstan, and Poland). This was an interesting time as it was the first programme attended by Asian students, and their welcome presence broadened the multicultural ethos. Immerse yourself in the literature, history, and culture of Esperanto; become familiar with the linguistics of Esperanto and the richness of planned languages generally; acquire a working knowledge of linguistics and international communication. – here is the constant offer of the Program of Interlinguistic Studies in UAM. As part of a third-year specialism students may follow a module in teacher training, the only university-level course in teacher training offered in collaboration with ILEI and Edukado.net. 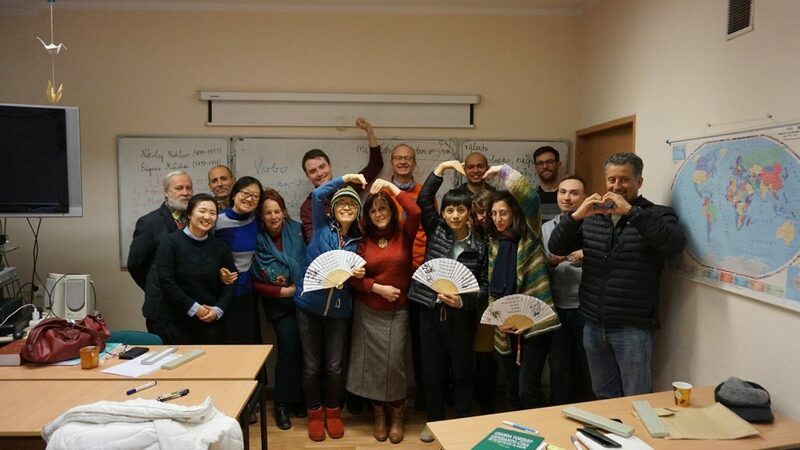 The students of Interlinguistic Studies leave well-versed in interlinguistics and esperantology or teaching of Esperanto with a solid and broad theoretical and practical knowledge. The next teacher training module takes place in 2019/20. One-week intensive study sessions take place in Poznań twice a year (September and February); each comprises four study subjects. Between times, students work at home with virtual contact, and on the internet. The multicultural make-up of the groups has shown that an international atmosphere impacts especially well on group work regardless of age, profession or cultural background. Esperanto bridges the different cultures and languages and appears to best advantage in its natural medium. Esperantology Workshops are particularly effective in kick-starting students' creative work (some of their papers have already been published). To date, around 150 students have taken part in the UAM Interlinguistic Studies Programme coming from around a score of countries ranging from Croatia, Macedonia, through Hungary, Switzerland, Russia to Brazil and the USA. Well-known experts in their field guide the students along their voyage of discovery: Vĕra Barandovská-Fank (Cz/De), Tomasz Chmielik (Pl), Nicolau Dols Salas (Es), István Ertl (Hu/Lu), Michael Farris (Usa/Pl), Aleksander Korĵenkov (Ru), Ilona Koutny (Hu/Pl), Katalin Kováts (Hu/Nl), Lidia Ligęza (Pl), Humphrey Tonkin (USA); Marc Bavant (Fr), Detlev Blanke (De), Probal Dasgupta (Barato), Michel Duc Goninaz (Fr), Zbigniew Galor (Pl), Aleksander Melnikov (Ru), Sabine Fiedler (De), Zsófia Kórody (Hu/De), Maria Majerczak (Pl), Blazio Vaha (Hu), and John Wells (GB) have also contributed several times. Check our websites (in English, Polish, and Esperanto) to view the study plan, read reports of past programmes, browse photos, and see the names of current lecturers and contributors, and other information. Having completed the usual home-study tasks and the third-year examination, students take an overall final examination and undergo a short 'Viva' during which they explain and defend their final thesis. Successful students are awarded a post-diploma certificate in Interlinguistic Studies (UAM). This comprehensive programme is on a par with other programmes of philological studies in other languages, and yet in its focus and content it is unique. The Esperantic Studies Foundation offers grants to students, and has done so since 2002; this helps many to complete the programme who might otherwise have been unable to pay the costs of study or travel. The more money available the greater the number of students that can follow the course and who can subsequently emerge well-qualified, and ready to teach. Please support this unique programme with a donation: AMU Poznanon. Any contribution will be much appreciated. Ilona Koutny – often with her colleague, Michael Farris, – offers an interlinguistics course in English under the auspices of the Department of Modern Philology: International communication – international languages. Erasmus students may also take part. 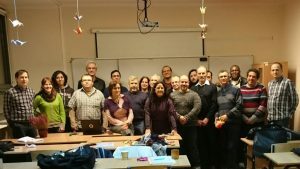 Since 2008, Interlinguistic Studies has organised an Interlinguistic Symposium every third year which is open to both Esperanto-speaking and non-Esperanto-speaking researchers. Selected presentations appear as articles in the University linguistic journal (editor: Ilona Koutny): JKI (Language. Communciation. Information). Students may also complete a Doctorate on subjects relating to Interlinguistics and/or Esperantology under the guidance of Prof. Ilona Koutny (Vidu: Ida Stria en 2016). If you would like to find out more, contact Ilona. Director of the Interlinguistics Studies Programme, UAM.